09:30hrs:Drive north via Mt.Kenya past coffee plantations to Samburu Game Reserve noted for the unusual Reticulated Giraffe, Grever's Zebra, Gerenuk and the blue-shacked Somali ostrich. Lunch and game drive en-route. Dinner and overnight at the camp/lodge. A full day in Samburu Game Reserve with early morning and late afternoon game viewing. Meals and overnight at the camp/lodge. Leave after breakfast with game driven en-route. Drive past the northern tip of the Aberdare Mountains to descend into the Great Rift Valley Where Lake Nakuru is located. Picnic lunch en-route arriving late in the afternoon. Dinner and overnight at a Nakuru budget/hotel. 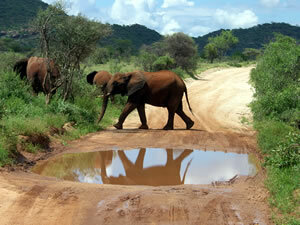 Depart for early morning game drive.Rothchild giraffees are found in this park,Millions of Flamingoes,Rhinos ,leopard. Lunch will be served in a hotel while enroute to Nairobi.